The problem is overall capacity, not favoritism. Late last month, the Federal Communications Commission finally approved new net neutrality rules based on Title II, which allows the agency to regulate so-called "common carriers." Net neutrality advocates hailed the decision as a victory for all Internet users. The new net neutrality rules prohibit Internet service providers such as Comcast (NASDAQ:CMCSA), Verizon, (NYSE:VZ), and AT&T (NYSE:T) from offering "paid prioritization" -- so-called fast lanes -- to companies willing to pay fees. ISPs are also barred from blocking or deliberately slowing traffic from any (legal) website. The FCC is cracking down on ISPs like Comcast. Photo: The Motley Fool. However, while net neutrality advocates assume the new rules will lead to a faster, better Internet for everybody, the opposite result is more likely. By limiting ISPs' ability to monetize increases in Internet traffic, net neutrality might actually increase network congestion over time -- paradoxically dooming everyone to slow lanes. As my Foolish colleague Jamal Carnette recently noted, net neutrality opponents have frequently resorted to philosophical arguments about the pitfalls of government regulation in arguing against the FCC's new rules. Meanwhile, net neutrality supporters repeatedly brought up the bogeyman of ISPs blocking or "throttling" websites that refused to pay tolls for last-mile access. Yet there's no real evidence that ISPs have ever done this, or that they would ever try, given the certainty of a strong customer backlash. Unfortunately, reality got lost in the shuffle. The problem is not that all regulation is bad, nor is it that ISPs are itching to block the websites of small start-ups. Quite simply, the main issue is one of burden-sharing. How much money will be invested in speeding up the Internet, and who will pay for it? This is critical given the rapid growth of Internet traffic, particularly at peak times. According to networking giant Cisco, global Internet traffic will increase threefold from 2013 to 2018 (with North America growing at roughly the average rate), with "busy-hour" traffic growing even more quickly. To handle this traffic growth, ISPs will need to make massive investments in the next few years. However, under net neutrality, they will have fewer options for monetizing these capacity increases, making it less likely the investments will be made in the first place. To understand how "fast lanes" can be good for everyone, let's look at some real fast lanes. In late 2012, new express lanes opened on a congested 14-mile stretch of the Capital Beltway in Virginia. The roadway was expanded from eight lanes to 12 lanes. The old lanes (four in each direction) remain free for all users. The new lanes (two in each direction) are subject to variable tolling. Depending on how busy they are, the price is adjusted to keep traffic moving at least 45 mph. Thus, the toll might be $2 overnight but $10 or more during rush hour. Buses, motorcycles, and carpools of three or more people can use the express lanes for free. The new express lanes offer a much faster, more reliable trip than was possible before they were built. And while there hasn't been a formal traffic study, traffic flow appears to have improved on the free "slow" lanes as well. That's not too surprising, considering that the overall capacity of the roadway was increased by 50%. In fact, a Government Accountability Office study found that introduction of high-occupancy toll lanes on I-394 in Minnesota improved traffic throughput on both the express lanes and the free lanes, even though no lanes were added to the highway in that case. Critics of the high-occupancy tolling scheme argue the system favors people who can afford the tolls, while working-class commuters are confined to the "slow" lanes. But without the tolls, the project wouldn't have attracted roughly $2 billion in private capital, and the lanes would never have been built. In that case, commuting times would be worse for everyone today. Fundamentally, there's no difference between Internet traffic congestion and road traffic congestion. The Capital Beltway high-occupancy tolling project reduced congestion by 1) encouraging private investment in additional road capacity; and 2) incentivizing drivers to reduce congestion by carpooling or traveling at off-peak times. Net neutrality will make it difficult or impossible for the same concepts to be applied to Internet traffic. For example, Netflix is encouraging customer adoption of ultra-high definition streaming by charging only 33% extra ($11.99 per month vs. $8.99 per month) for this service. Yet Netflix said customers need five times as much bandwidth for ultra-HD streaming as for standard HD streaming. It's doubtful that many people would pay five times as much for ultra-HD, but opting for ultra-HD instead of regular HD does put five times more burden on the ISP. This requires more investment. In a non-net neutrality world, Comcast, AT&T, and other ISPs could make a deal in which Netflix would subsidize the additional capacity needed to carry its new ultra-HD content. Instead, ISPs can finance this incremental investment by raising customer prices or accepting lower margins. However, U.S. consumers are already paying some of the highest broadband prices in the world and can't afford to pay much more, while most ISPs (with the notable exception of Comcast) aren't making much money as is. 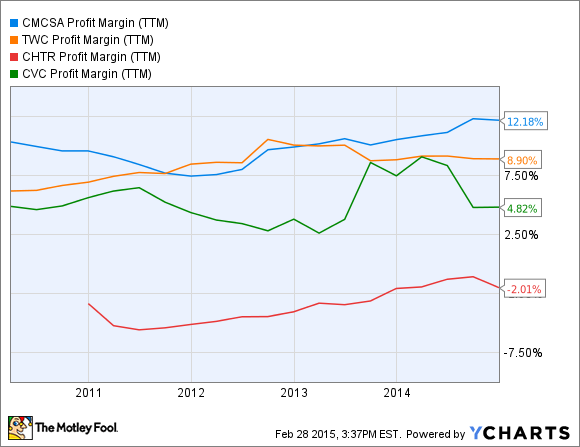 ISP Profit Margins (TTM), data by YCharts. Verizon has been cutting back investment in its FiOS fiber network, which has not produced an adequate return on capital to date. AT&T has also announced a slowdown in its fiber investment plans due to the new net neutrality regulations, although it's unclear just how much its plans have changed. If net neutrality encourages even more capital-expenditure cuts by major ISPs, banning "fast lanes" will have produced a counterintuitive result: slow lanes for all.